Reality Uncovered Forums • View topic - Evidence of Alien Life on Meteorite ? Evidence of Alien Life on Meteorite ? 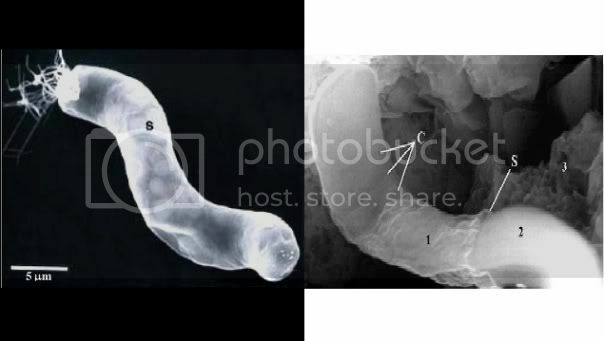 A photograph taken through a scanning electron microscope of a CI1 meteorite (right) is similar in size and overall structure to the giant bacterium Titanospirillum velox (left), an organism found here on planet Earth, a NASA scientist said. Members of the Scientific community were invited to analyze the results and to write critical commentaries or to speculate about the implications. These commentaries will be published on March 7 through March 10, 2011. Re: Evidence of Alien Life on Meteorite ? Why was this published by the "Journal of Cosmology" I wonder..? (actually, I don't wonder why at all..).. Naturally, JOC's success posed a direct threat to traditional subscription based science periodicals, such as "science" magazine; just as online news killed many newspapers. Not surprisingly, JOC was targeted by science magazine and others who engaged in illegal, criminal, anti-competitive acts to prevent JOC from distributing news about its online editions and books. As we all know, the leadership at NASA is a disaster. Just last month NASA's Aerospace Safety Advisory Panel concluded that NASA is "adrift" and dysfunctional. Its leadership is under attack by Congress and is good only at leading a retreat and killing programs. They are running scared with their heads down, fearful of upcoming Congressional hearings, fearful of more criticism, fearful of losing their jobs. Fear. Fear. Fear. Life on Earth, Came From Other Planets ---and this is something the Bible-thumpers, the "leadership" at NASA, and the status quo, do not want the public to know. Umm, this is a unbiased, respected scientific journal? Anyway, in regard to the claim, my response is shallow and flippant.. Just because it looks rather like some earthly life-created structure, that's good enough? Save me. OK, he also gives some extraordinarily complex and extraordinarily lengthy and rambling discussions (often without clear justification) about chemical clues he supposedly found, and I'll leave it to the *real* 'astrobiologists' to debate all that. But his analysis reminds me very much of Bruce Maccabee (that's an injoke)... He uses the word 'astonishing' a lot. Very easily astonished, is Mr/Dr Hoover, imo. It's also most interesting to note NASA'a complete silence. I suspect they are thinking hard about the relationship..
That's bull', you are right, NASA would be more than happy if they found AL (and even declared Panspermia to be confirmed) here on Earth or anywhere else for that matter ! That's a page worth translating - some interesting pics..
And yes, as I alluded above, I too was struck by the irrelevant directions he went in that 'paper', inc the hair of the mammoth.. Like i said - it's the maccabee disease.. In 1965, a fragment of the Orgueil meteorite, kept in a sealed glass jar in Montauban since its discovery, was found to have a seed capsule embedded in it, whilst the original glassy layer on the outside remained apparently undisturbed. Despite great initial excitement, the seed capsule was shown to be that of a European rush, glued into the fragment and camouflaged using coal dust. The outer "fusion layer" was in fact glue. Whilst the perpetrator is unknown, it is thought that the hoax was aimed at influencing 19th century debate on spontaneous generation by demonstrating the transformation of inorganic to biological matter. One stone of the Orgueil meteorite shower contains an assortment of biogenic materials: coal fragments, seed capsules of the reed Juncus conglomeratus, other plant fragments, and an optically active, water-soluble protein material resembling collagen-derived glues. This sample seems to have been accidentally or deliberately contaminated shortly after the fall of the meteorite in 1864. Thx Bob Rekin for the info. Might be the third time then ? But Dr. David Marais, an astrobiologist with NASA’s AMES Research Center, says he’s very cautious about jumping onto the bandwagon. To be honest, it is how I personally suspect "alien life" will be discovered if it ever is - under an electron microscope, not over the skies of Washington. Yes, but is that what they are really doing? That 'Journal' does not have a good reputation in this regard - their idea of 'peer review' is rather different from more respected science journals. And there is a reason those other journals are more respected.. It is somewhat misleading to call this a 'discovery'. There are some unusual structures in a sample, and he is making a huge leap to some pretty explicit claims. Who was specifically invited, and how? What was the nature of the additional 'general invitation'? Why was this process necessary? Has this paper/claim been subjected to peer review before? I understand that the answer to this last question is.. Yes. That previous attempt to gain peer review was unsuccessful - it would be worthwhile to look at why (haven't had time to do so, yet).. I'm rather stunned by this claim - on what basis does he make those extraordinary statements?? No other paper has received such 'thorough vetting'? Give me a break. I get the strong impression that this paper has been largely shunned and ignored by the scientific community for very good reason - it is flaky science, tries to tie in unrelated subjects, contains unsupportable conclusions.. all while ignoring important issues, potential errors and provisos. That, I agree with. But I'm not seeing good enough evidence in that paper.